Webhooks are an extremely important tool for many of our merchants. Configuring webhooks allows Chargify to “speak” to external tools/services by posting subscription and billing related events out when they happen. Thousands of integrations are driven by webhooks in Chargify. With this update, you can control what events are posted for every endpoint. So multiple endpoints can receive different events…you’re in charge. Many of our merchants have found themselves in similar situations, and we’re happy to have released a solution. Do you have multiple webhook endpoints enabled? 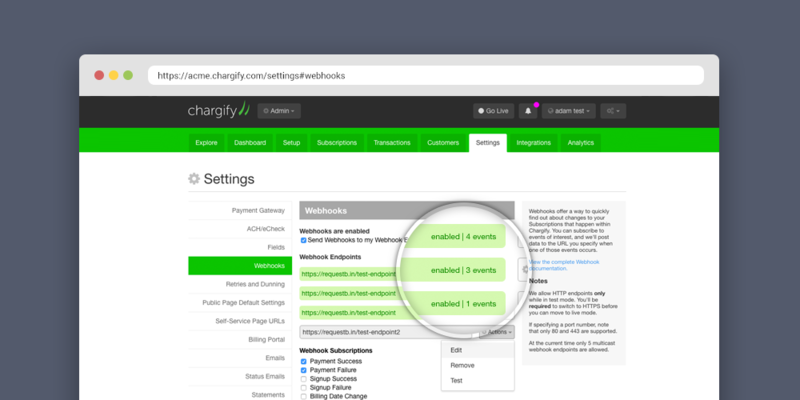 For more information about enabling and configuring webhooks in Chargify, check out our webhooks documentation. As always, if you have any questions, email support@chargify.com and our awesome support team can assist you.